However, I envisioned a few changes. 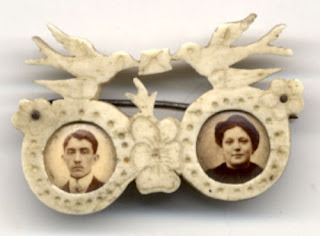 Instead of a love note being borne through the air by two lovebirds, I pictured something more like mourning doves delivering a mourning card to an unlucky recipient. How peculiar... the hummingbird is positioned directly over the groom. 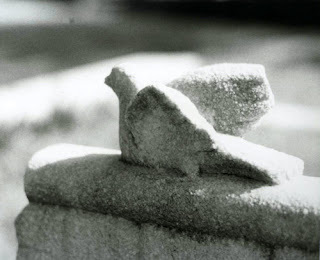 Here the hummingbird symbolizes the ephemeral. 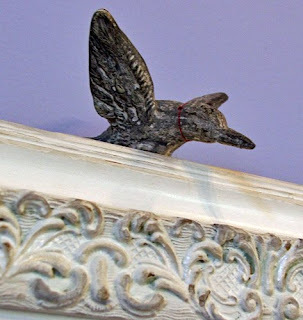 It is perched upon the frame and ready to take flight like a winged soul. My work usually has a literary source of inspiration, and this is true for to part no more. 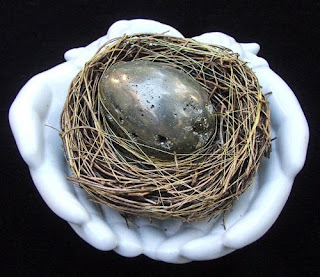 The assemblage was inspired by Henrik Ibsen's (1828-1906) play, A Doll's House (1879). This passage is near the end of the play when Nora (a.k.a. 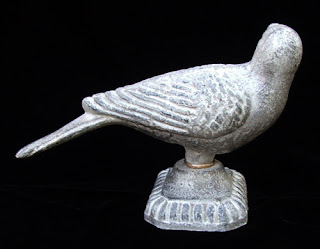 my sweet little skylark) announces to her husband, Torvald Helmer, that she is leaving him. "Hel. To desert your home, your husband and your children! And you don't consider what people will say! Hel. It's shocking. This is how you would neglect your most sacred duties. Hel. Do I need to tell you that? Are they not your duties to your husband and your children? Hel. That you have not. What duties could those be? Hel. Before all else you are a wife and a mother. Nora. I don't believe that any longer. I believe that before all else I am a reasonable human being just as you are - or, at all events, that I must try and become one. I know quite well, Torvald, that most people would think you right and that views of that kind are to be found in books; but I can no longer content myself with what most people say or with what is found in books. I must think over things for myself and get to understand them. Hel. Can you understand your place in your own home? Have you not a reliable guide in such matters as that?---have you no religion? Hel. What are you saying? Nora. I know nothing but what the clergyman said when I went to be confirmed. He told us that religion was this and that and the other. When I am away from all this and am alone I will look into that matter too. I will see if what the clergyman said is true, or at all events if it is true for me." I also wanted to use the lock and bars to convey the sense that the "family" inside are trapped inside a domestic prison. 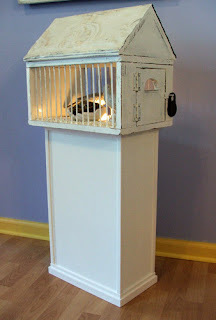 I adhered rice to the floor of the birdcage. The rice references the tradition of throwing rice at a newly married couple and it symbolizes abundance, fertility and prosperity. 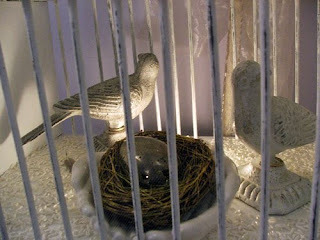 I used the mourning doves and egg as substitutes for the future family. 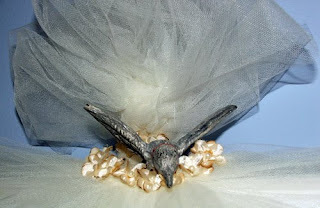 The legs of the mourning doves are banded with gold wedding bands. 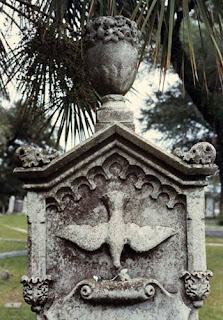 Doves frequently appear in mourning art and symbolize the Holy Spirit or the soul. 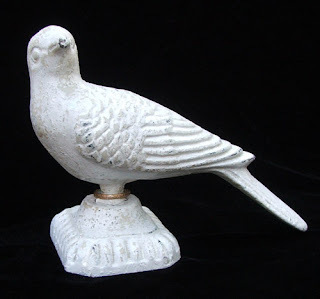 They are associated with mourning, or symbolize the experience of mourning, because their call - the low, soft cooing - gave the impression to listeners that the dove was lamenting or mourning. 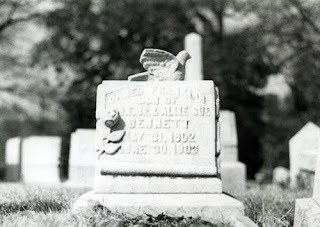 "Life spans were still quite short in the first three-quarters of the 19th century, with the average age of early Victorians at death being forty to forty-five... 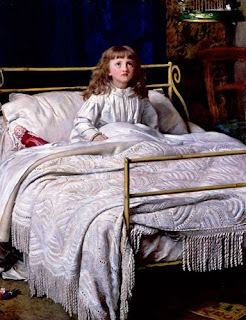 Historians have estimated childhood deaths at between one-fifth and one-third of all children under the age of ten during the 18th and 19th centuries, with regional epidemics experiencing childhood death rates as high as fifty percent." As you know, the title of the exhibition is Wimpel! 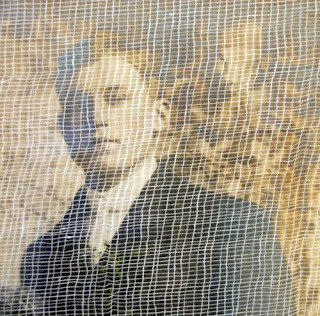 Wrapped Wishes and traditionally, wimpels were made from the cloth used to swaddle a baby boy during the Jewish covenantal ceremony of circumcision. 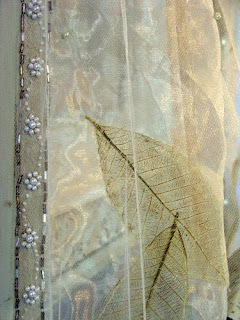 Somehow, however loose an interpretation, I wanted to incorporate wrapping into the assemblage. 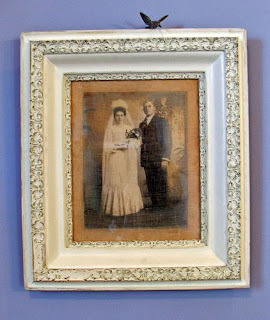 I did this by layering cheese cloth between the wedding photograph and the glass that covers it. 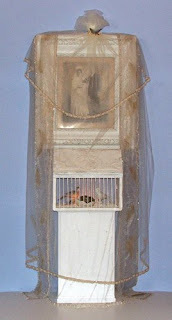 The wedding veils also wrap and enclose the wedding portrait, birdcage/house and pedestal. For me, both suggest a winding sheet, a sheet for wrapping a corpse, or a shroud. 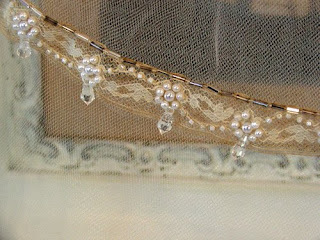 Above, a subtle mourning motif - crystal teardrop beads on the outer wedding veil and on the bride and groom's wimpels. And these? DIY. Sometimes you just have to make stuff up or create your own imagery. There are many tree, flower and plant mourning symbols, but I haven't come across a general one for falling or fallen leaves. 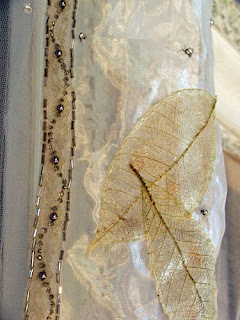 These are painted leaf skeletons and I placed them on the wimpels as if they were falling to the ground, alluding to the weeping willow motif and echoing a teardrop shape.